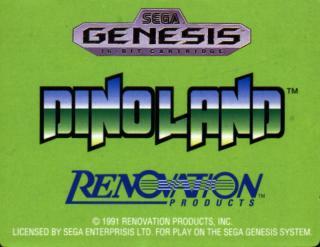 The fun of pinball and the excitement of vicious fighting dinosaurs are the highlights of Dinoland(tm). (You can also learn something about dinosaurs by reading the manual.) You normally get 3 lives. 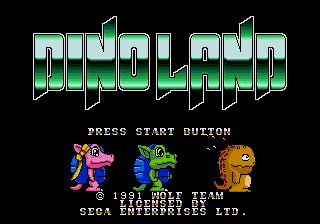 Use DINO Codes 1 thru 18 to select the number of lives you want. Codes 9, 10 and 19 give you infinite lives. 10 is the normal number of bonus points. Select more or fewer with Codes 20 thru 27. 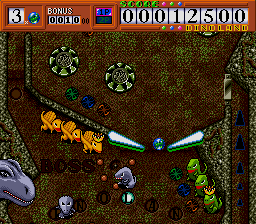 PREMISE:          Pinball sim with a chan-style dinosaur theme. The bosses on this game are disturbing. You have to battle against huge SD creatures while avoiding falling into doom's trap (the pit...) at the same time, you must keep the little critter riding the dinosaur from capturing your girlfriend (by using your limited ability to walk around for a time and touch the dino rider) I have only been able to beat the first boss once and i havent succeeded in beating this game even with codes. unless your a pinball wizard, be warned. I bought the japanese version, and it's one of those JUE carts that are the same everywhere.